IPM qualification testing showing high current operation (2.5 kA). Voltage across the switch (blue), current in the coil (pink), and saturated current transformer (green). A customer needed a solution for driving a high current (40 kA) and maintaining a flat top for 10 ms in an electromagnetic coil. In order to minimize the ripple on the coil, the circuit would need to pulse width modulate at 100 kHz. Working with the customer, EHT performed initial circuit modeling to determine the number of Integrated Power Modules (IPMs) that would be needed operating in parallel as well as identify potential fault conditions. EHT engineers designed and constructed the cabling from the user’s capacitor banks to the IPMs and from the IPMs to the coil. Before delivery, each IPM was tested at EHT to the user’s specifications (2.5 kA/IPM). The figure shows high current operation at 100 kHz. The voltage across the switch decreases over the course of the shot due to energy being drained from the capacitor bank. The current (pink) was measured with a Rogowski coil and EHT Integrator. The current changes shape because the pulse width was changed half way through the shot. 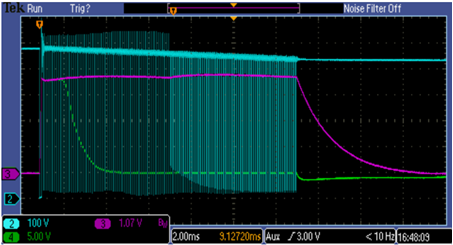 The green trace shows the current transformer, which saturates after a couple of milliseconds. These units were installed at the customer facility with phone support by EHT engineers. The coil driver constructed with modified EHT products allowed the scientists to successfully conduct their research.